If your fracture is unstable (meaning the bones could move around a lot) you might need surgery. This usually involves wires or, occasionally, screws to hold the broken kneecap together while it heals. The operation is called an open reduction internal fixation, often referred to as ORIF. If the broken part of your kneecap is small and ORIF is not possible, the surgeon may remove the broken bit. Very occasionally a kneecap can be so badly broken it can't be repaired. 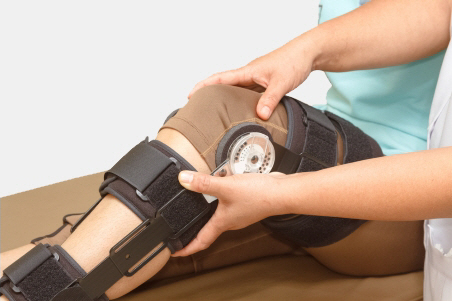 If this happens, or if your surgery is not successful, your kneecap may be removed. It will not be replaced, so this only happens if there are no other options. Your orthopaedic surgeon will talk to you in detail about your operation before any surgery. During the operation you will be given antibiotics. It's usual to spend a night in hospital. Your leg will be in a brace after surgery, and it will stay on for four to six weeks. For the first two weeks the brace will keep your leg straight, but after that your doctor may adjust it to allow some movement. You won't be able to drive while your leg is in a brace. If you are older than 65, Older Person's Health Specialist Services will also see you and review your health alongside the orthopaedic team, to manage any other medical issues you may have. After surgery you may have a small drain in place to stop fluid building up around your injured knee. This will be taken out after 24 hours. Your leg will be up on a pillow to help reduce swelling. You will also see a physiotherapist, who will aim to get you moving as soon as possible. This helps to prevent problems that can happen with long periods of bed rest. These can include blood clots in your leg (deep vein thrombosis), infections, and muscle weakness. If it is uncomfortable putting weight on your leg, the physiotherapist will teach you how to walk with either a frame or crutches if you need them. You will be given a follow-up appointment, a discharge letter that explains what has happened to you and your treatment plan, and a prescription or medication card if you need one. You will need some time off work – how long depends on the particular operation you have, what your job involves, and whether there are any light duties you can do. As you recover from your surgery you will have some X-rays and regular appointments with your surgeon to check that the break is healing well. If you have had wires to hold your bones together, these will need to be taken out. This usually involves another operation. It's best to wait at least three months before getting the wires taken out. Some people who have had screws put in their kneecap find them painful. If this happens to you, talk to your surgeon about having them removed. This isn't usually done until 12 months after surgery, to make sure the bone has healed completely. If you have any other concerns after you go home, please see your GP. Written by HealthInfo clinical advisers. Endorsed by orthopaedic surgeon, Canterbury DHB. Page created February 2017. Last updated November 2018. OrthoInfo – Patellar (kneecap) fractures, retrieved January 2017.